by Andy Higgs in Eat, Drink and Be Merry, Europe, Features, Germany, Home, Places. 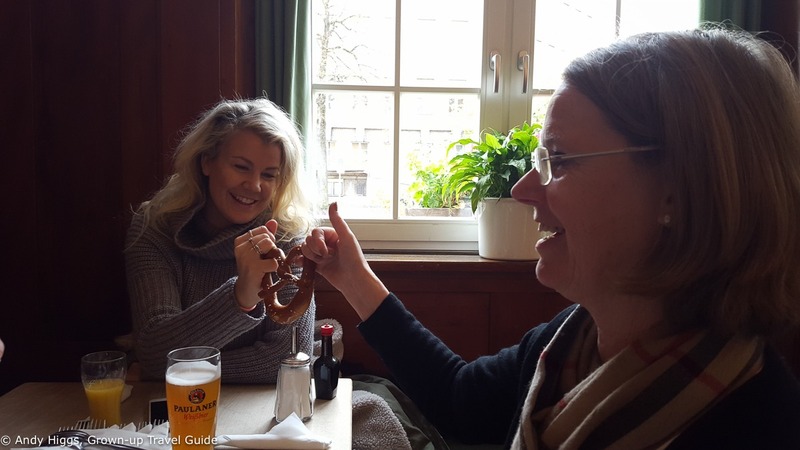 While getting up to speed you can also check out the Nordic Travel Bloggers collective and the official German Wurst Adventure website. 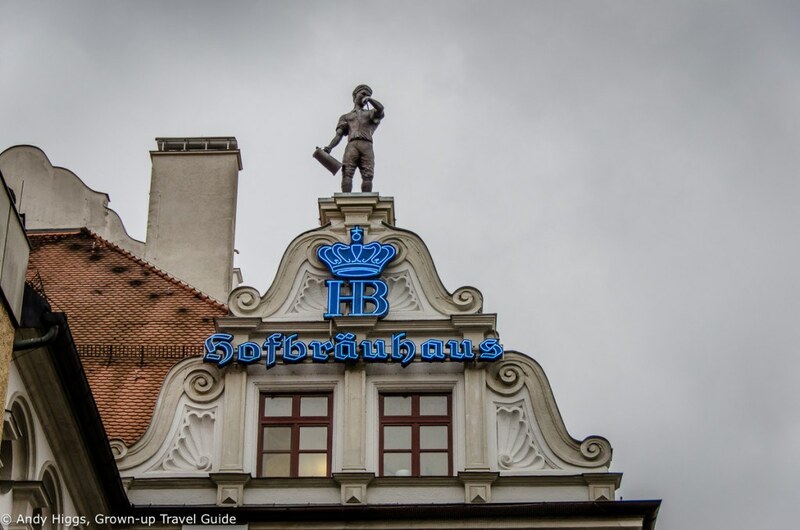 Our trip was sponsored by the German National Tourist Office for the Nordic region, with help from Deutsche Bahn and Best Western Hotels and assure you that all opinions are my own, as they always are. It was still raining when we emerged from the Best Western Hotel in Coburg after a satisfying breakfast to await our taxi to the station. Safe in the knowledge that we had pre-booked at reception the previous night we had allowed ourselves a little extra time in bed. Piling our luggage in the boot and jumping in as quickly as we could it was down to our driver to get us to the Bahnhof in time. Fortunately she managed it and despite the overly complicated collection procedure we were able to print out the tickets from the machine and make it to the platform with a couple of minutes to spare before the ICE rolled into Coburg. 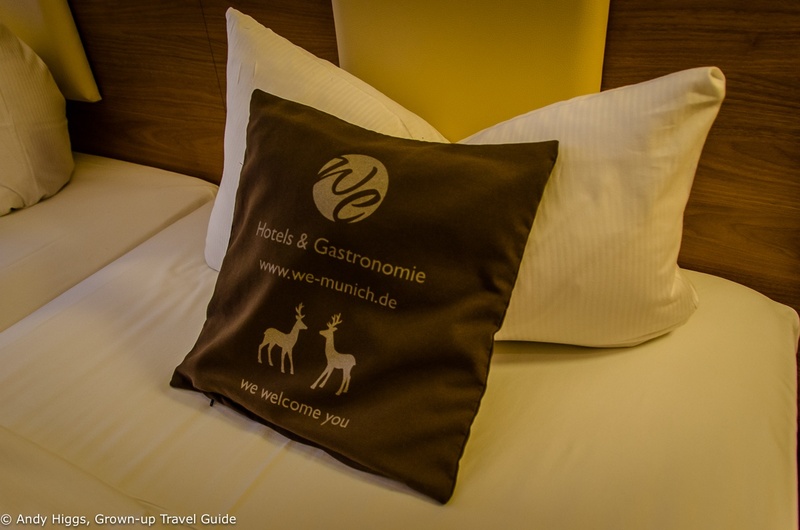 We had a fast trip to Nuremburg which passed uneventfully but was marred by the advertised onboard wi-fi for first class passengers not working – again. To tell the truth I wasn’t all that bothered as it meant I could relax instead of checking email and all the rest of it. With about an hour to wait at the main station in Nuremburg for our connection to Munich, we made the most of another perk of first class on Deutsche Bahn – access to the company’s lounges. These are fairly simple places but provide a quiet refuge from the main concourse and free coffee. 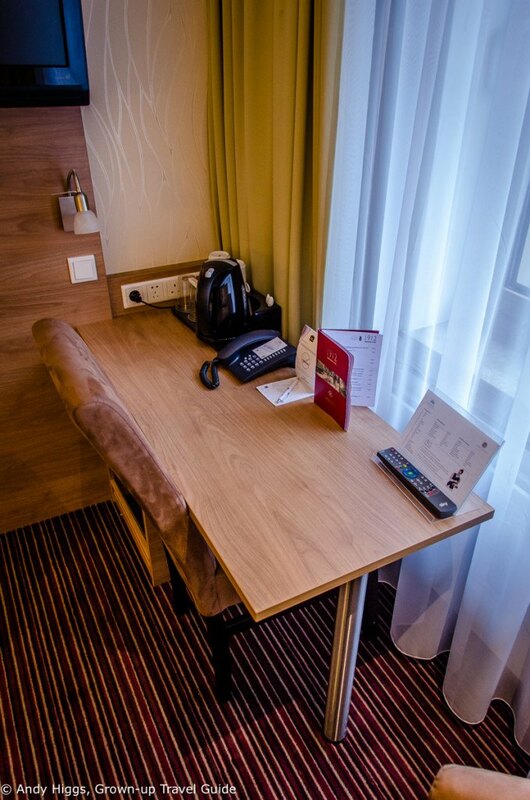 There are also newspapers and a television or two, and (fully functional) complementary wi-fi. Two cappuccinos later we were out the door and heading for the platform. The final train journey of the #WurstAdventure was another comfortable affair – and an extremely fast one. Nuremburg to Munich in 1.5 hours is very impressive, and we noticed the display in the carriage recording speeds of up to 290 km/h. 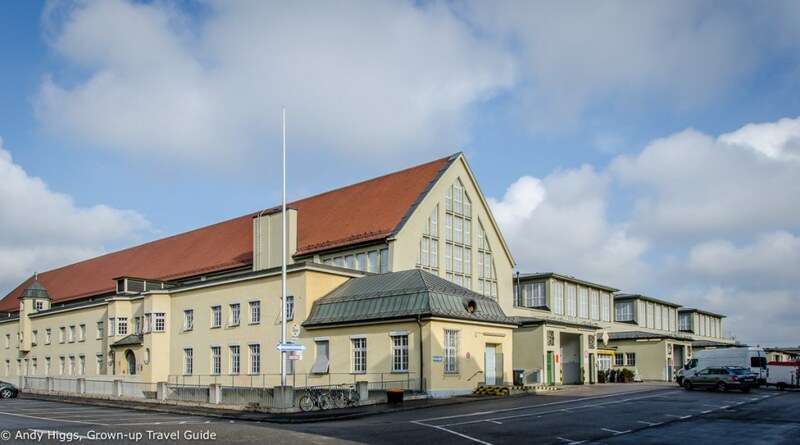 It’s a good 25 years since I was last at Munich Hauptbahnhof but not that much has changed – although it will do in the near future as a major redevelopment is on the cards. Our hotel for the night was just a couple of blocks away so we elected to walk – the sun was now out and it looked like we might be lucky with the weather for our last day and a half in Germany. We made it to the Hotel Cristal at 1 p.m. with the intention of showering, changing and dumping our bags before exploring the city a little later. That intention was shattered by the news that we would not be able to access our rooms until 4 p.m. To be honest, we were rather irked by this – not that we deserve special treatment but (a) I think 4 p.m. is the latest I have ever been told I can check in and (b) 4 p.m., really? After pleading with the receptionist we managed to shave an hour off this and left our bags in the hotel’s comically chaotic luggage store. That gave us plenty of time to find somewhere for lunch and a beer before we were due to meet our guide for a sausage-related tour of the city. It turned out that as well as being close to the station the Hotel Cristal is also close to the centre and is located in a colourful part of town. An intriguing mix of hotels, ‘exotic’ grocery stores and the remnants of a previously much larger red-light area, it makes for an interesting stroll. We found a rather unremarkable restaurant in the basement of a shopping centre and between us ordered just about everything unconnected with wurst. The food was very good (I had an excellent wiener schnitzel) and naturally the beer was great too. 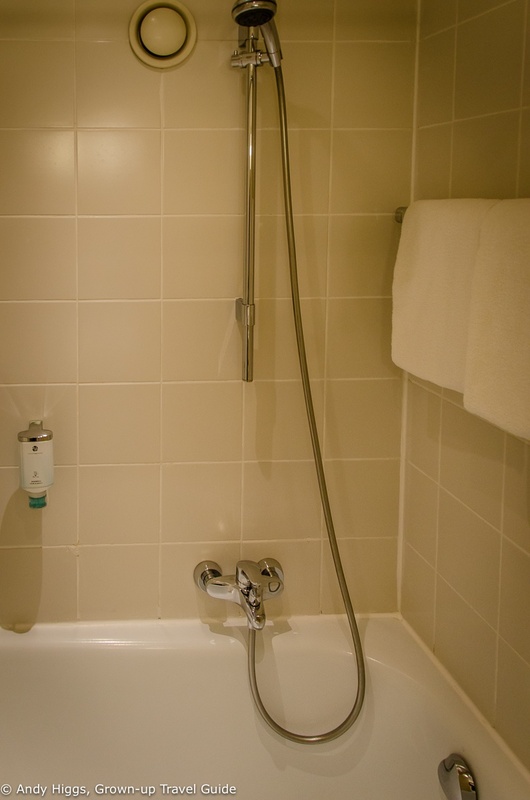 We returned to the hotel to find our rooms ready, giving us just enough time to shower and change before meeting again in the lobby. 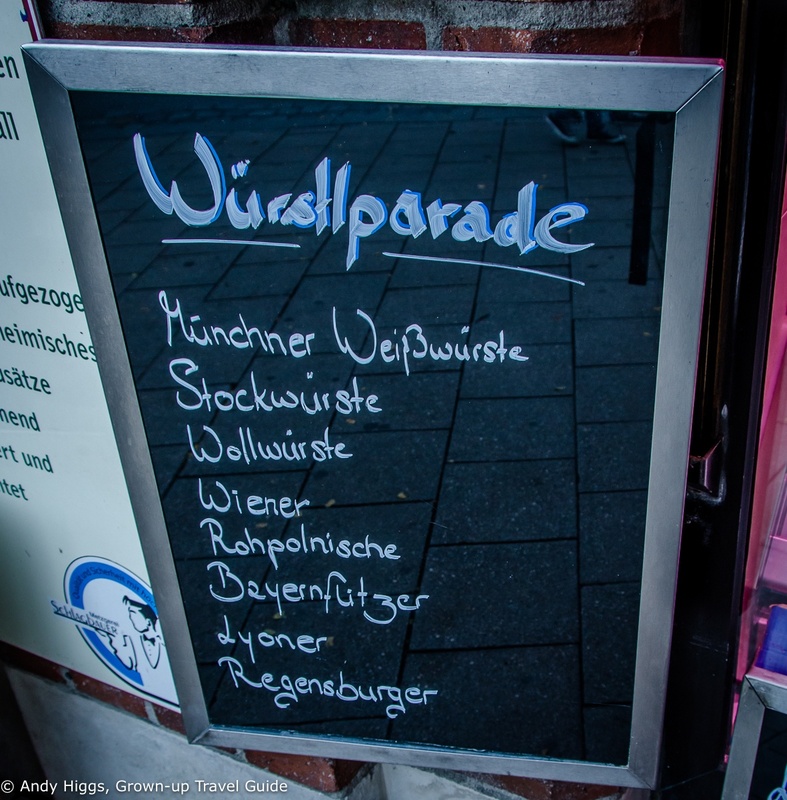 We walked back to the same pedestrian street where we had eaten lunch but this time continued on to Marienplatz – which we later were told is where everyone meets in Munich. After a couple of false starts we located our guide. Reidun is a native Norwegian who has lived in the city for nearly 30 years and is married to a local. She is fluent in both languages as well as English and incredibly knowledgable about Munich; so if you get a chance make sure you look her up. 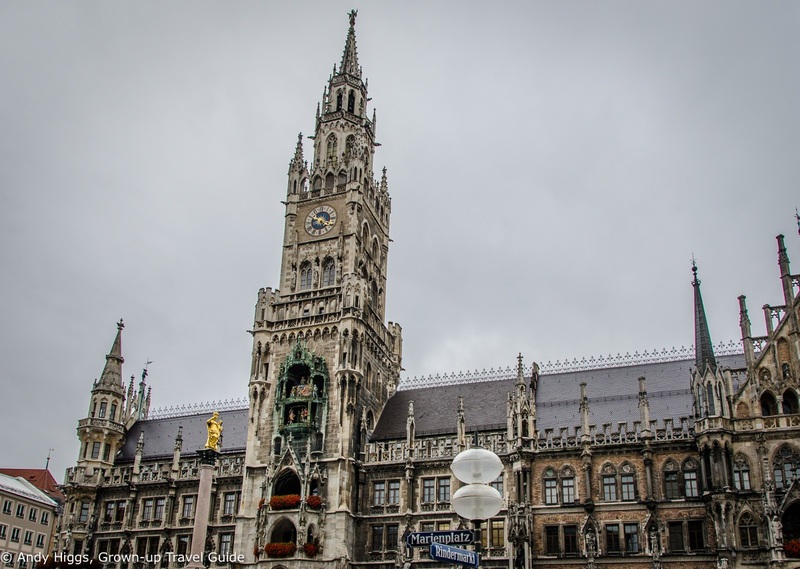 Marienplatz is central to both the city and the history of its most famous sausage, “Weisswurst” (white sausage). 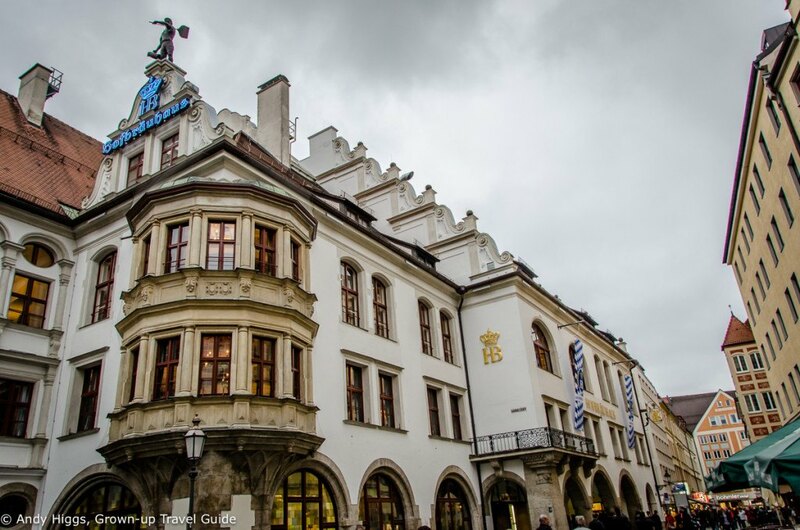 Apparently the first weisswurst was served by the eatery “Zum Ewigen Licht” on one side of the square in 1857, a fact that is heavily used in marketing efforts by the place currently at the same address. We will come back to weisswurst later, don’t worry. 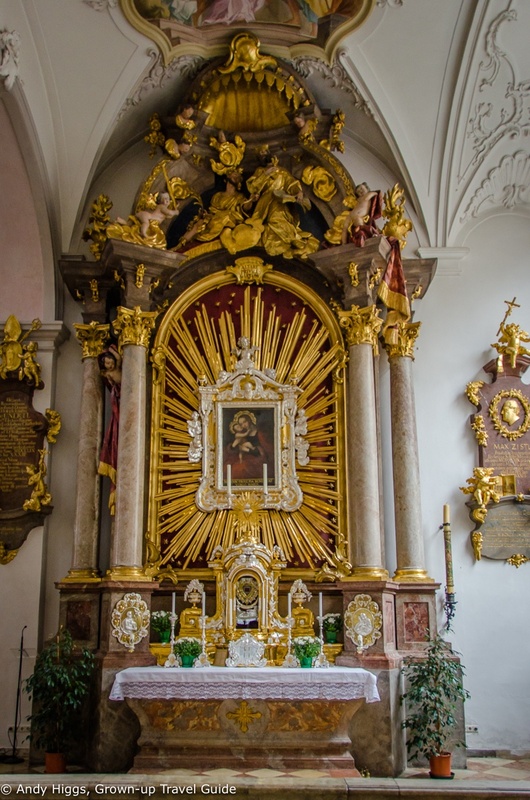 Although our short tour had a sausage theme we also took in a few more regular sights. First stop after the square was the spectacular St Peter’s Church. We popped inside for a closer look, which is definitely worth doing. 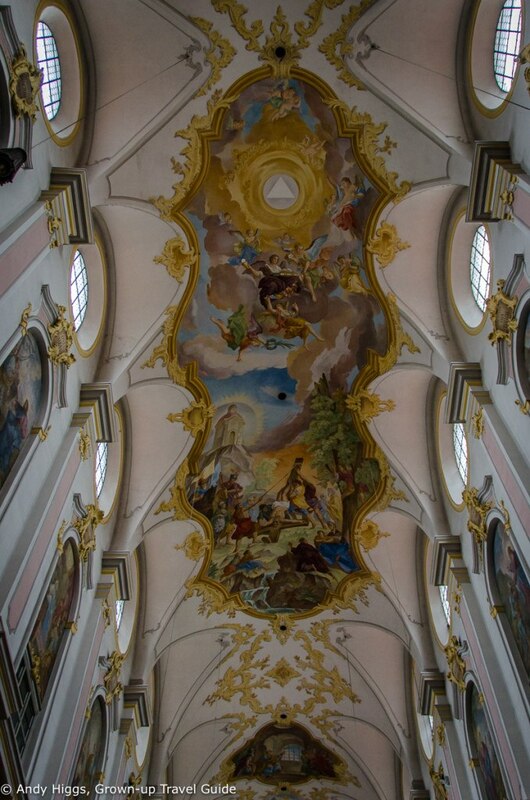 The ceiling fresco is actually new; having been recreated in 1999. 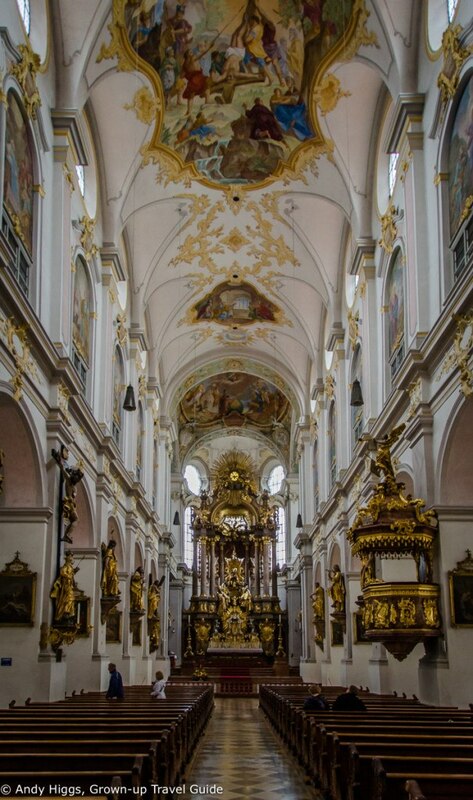 One thing I have come to realise from this trip is that Germany is not short of churches; but this one stands out as it is Munich’s oldest and the decor is stunning. The 91 metre tower is open to visitors and offers amazing views, but we didn’t have time for it on this occasion. Just round the corner is a row of butchers’ stores with a bewildering range of sausages – ‘a parade of sausages’ is clearly the correct collective term according to the sign here. 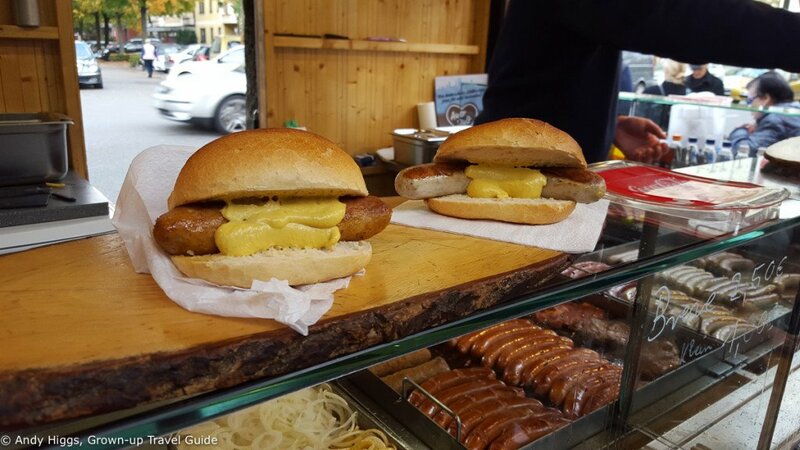 Reidun explained that quality is everything when it comes to wurst – and food in general – for the good burghers of Munich. Most find a preferred butcher and stick with them for good. 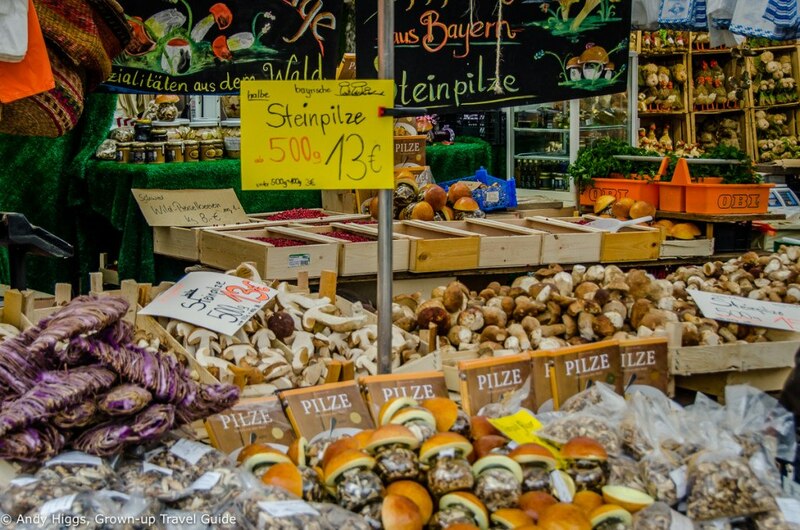 We then ventured to the Viktualienmarkt – a huge market area with stalls selling both local and international produce, food joints, beer gardens (yes, in the plural) and a smattering of regular shops into the bargain. 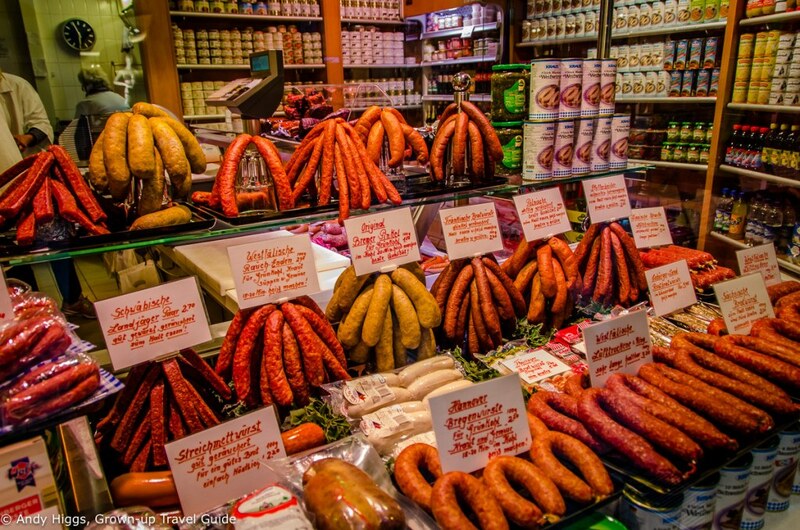 There are plenty of places to eat sausage as well as buy it to prepare yourself. 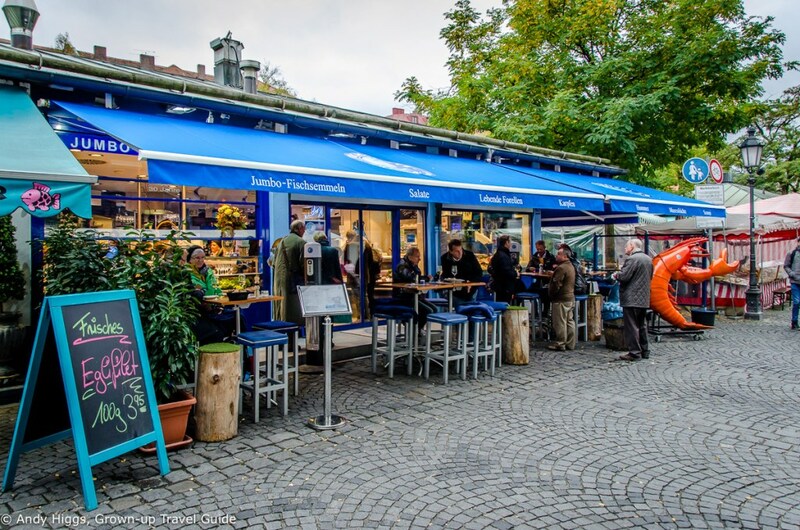 This place claims to be Munich’s smallest eatery – even with the outdoor tented extension. 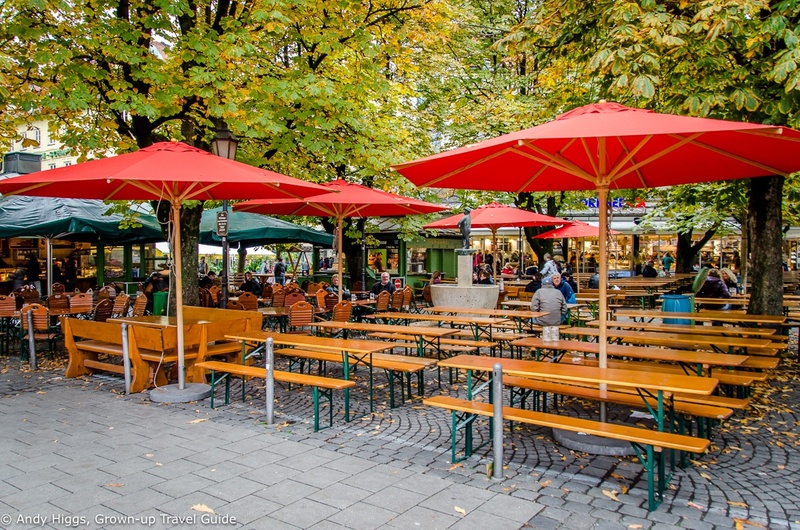 The beer gardens are divided into an area with service and one where you can bring your own food. You can drink beer at both, although the one with service is understandably more popular as you can see here. Interestingly the breweries operating here change in strict rotation – I believe each one gets a year at a time before they move out to allow the next guys to sell. It seems like a fair system and ensures that punters get some variety too. It’s not all beer and sausages – you can pick up fruit and vegetables too. It was mushroom season when we visited, which was clear from the stalls. 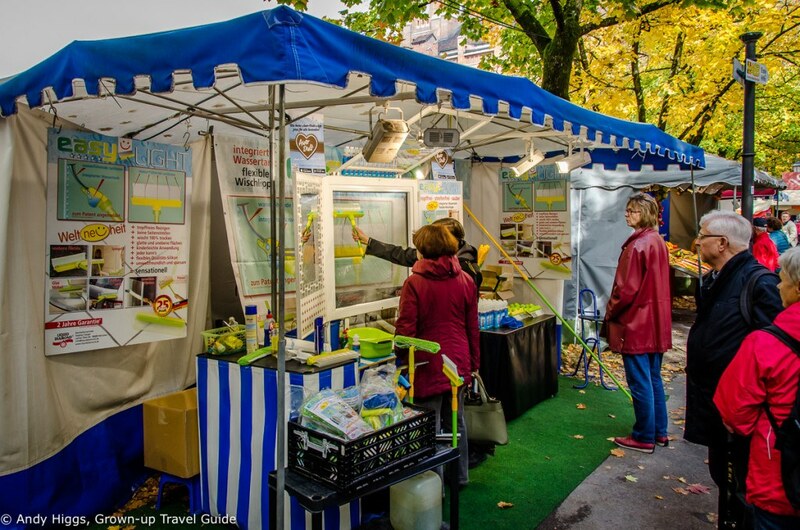 There is also a large section devoted to fish and seafood – with accompanying restaurants and fast food stands. 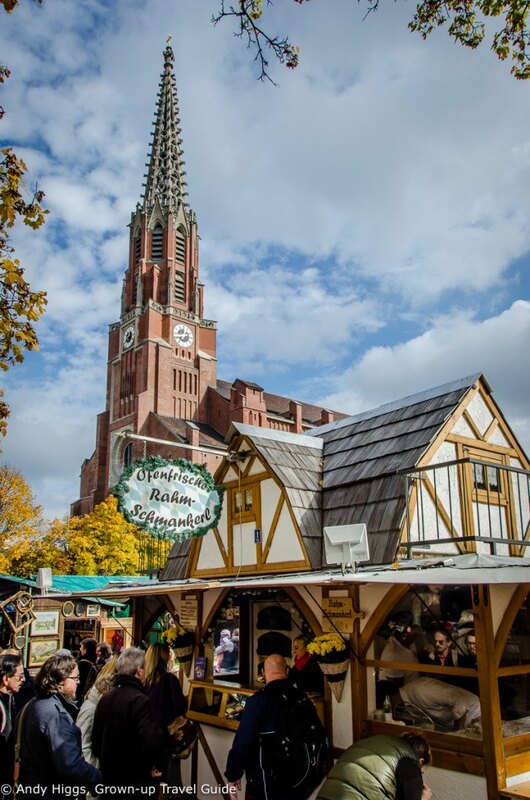 On one corner of the market is Der Pschorr, a beer hall serving excellent food and beer cooled using huge blocks of ice rather than modern refrigeration techniques. 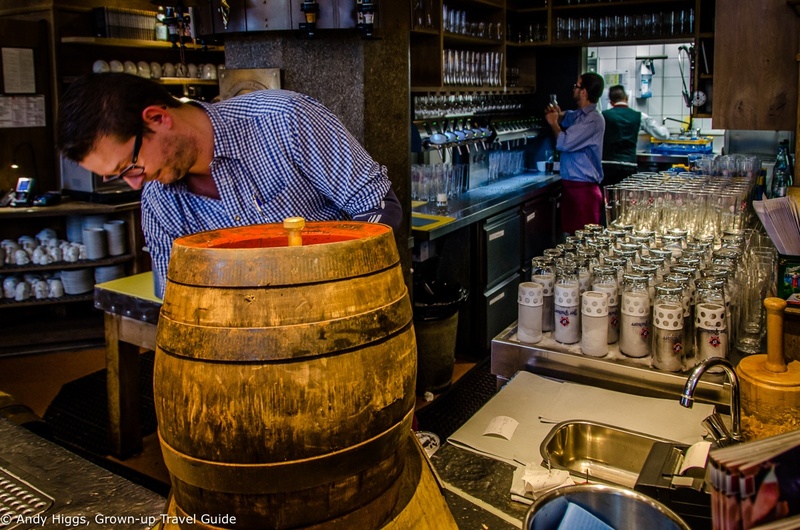 The ale is served from wooden barrels which are emptied alarmingly fast. 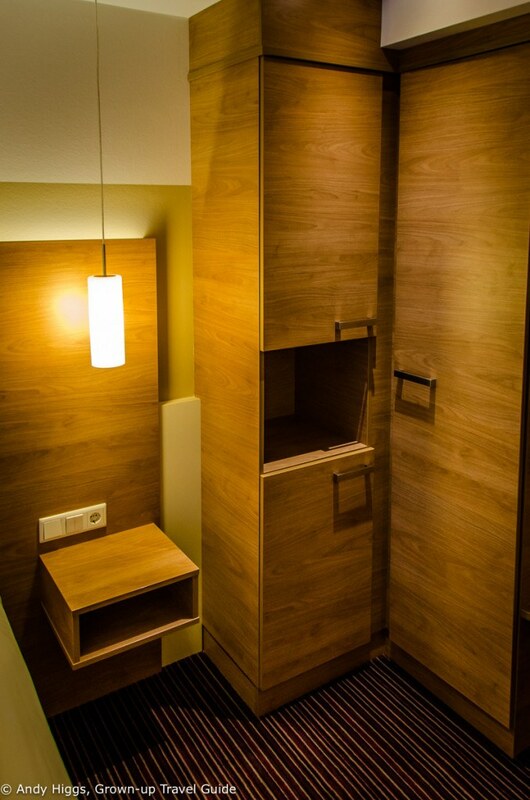 Visitors can go down to the basement to see the storage area. Whilst it’s debatable whether this old-fashioned method affects the taste in any discernible way the beer was excellent so that should be all the excuse you need to drop by. It’s a very popular place so if you plan to eat I would definitely recommend making a reservation. 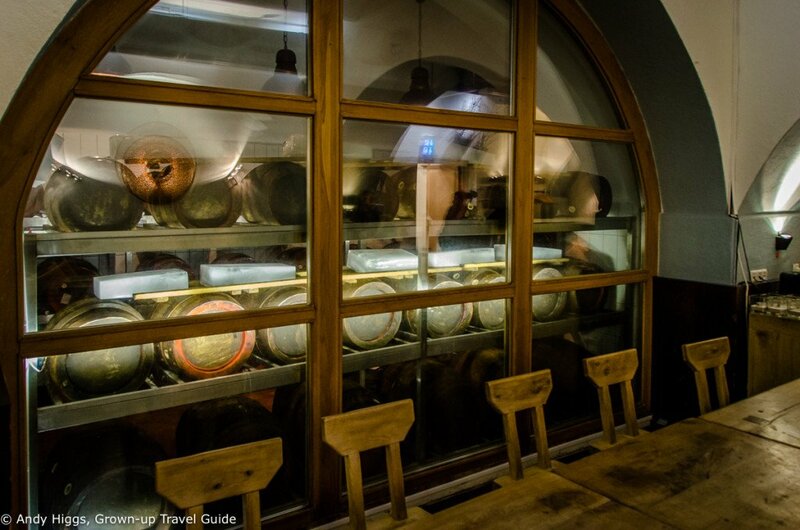 If it’s beer you’re after, Munich has you covered. 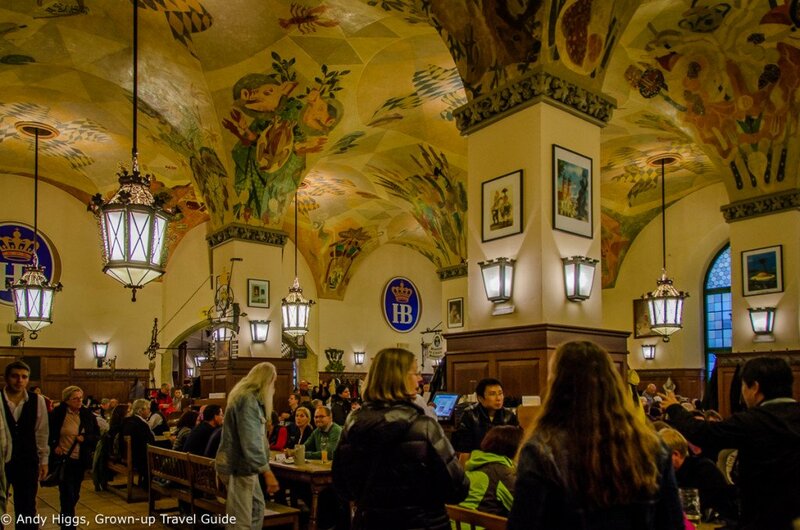 Most of the major breweries have their own huge beer hall in town, but the Hofbrauhaus is perhaps the most famous. 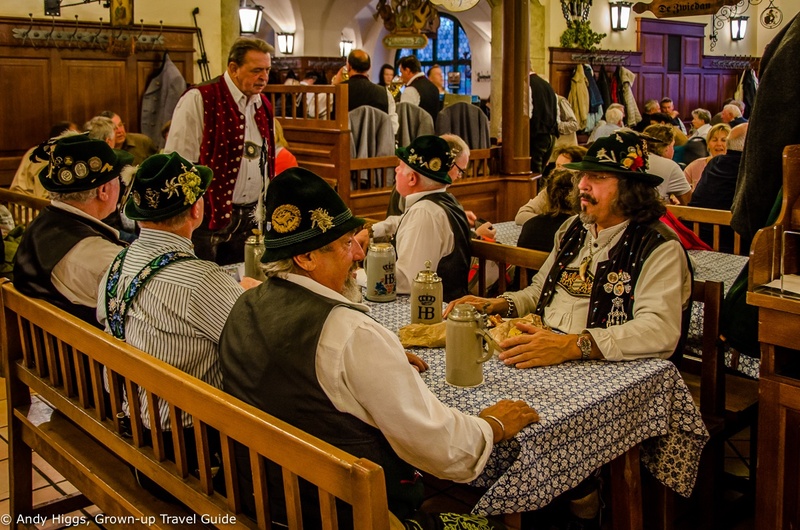 We could hardly visit Munich without dropping in, although we didn’t stay for a drink as it was pretty much full; hardly surprising on a Friday evening. It doesn’t usually take long for a space to become available and the atmosphere is quite something. It’s loud but friendly, and we loved the way some of the regular beer clubs get dressed up for the occasion. A neat and fairly recent innovation is the beer tankard safe. 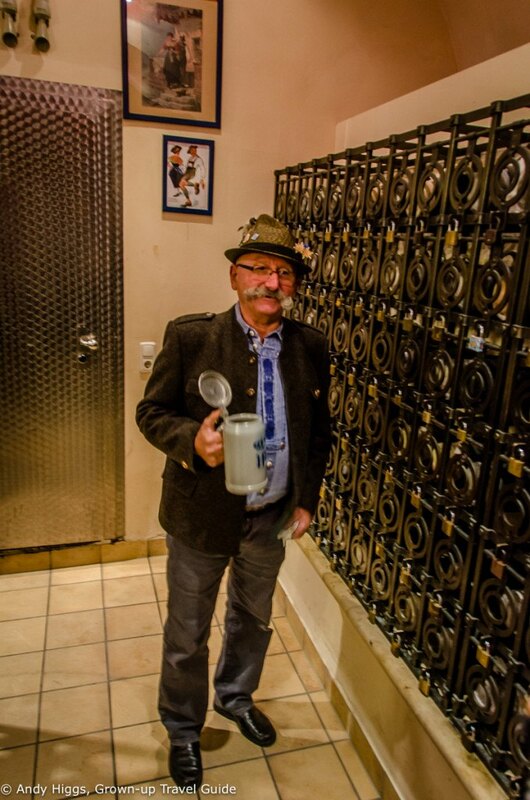 For a token fee (a few Euros a year) proper regulars can store their own beer mugs safely at the Hofbrauhaus, unlocking them and washing them out before their next session. I suspect that availability rather than cost is the main issue preventing more people from taking advantage of this facility. 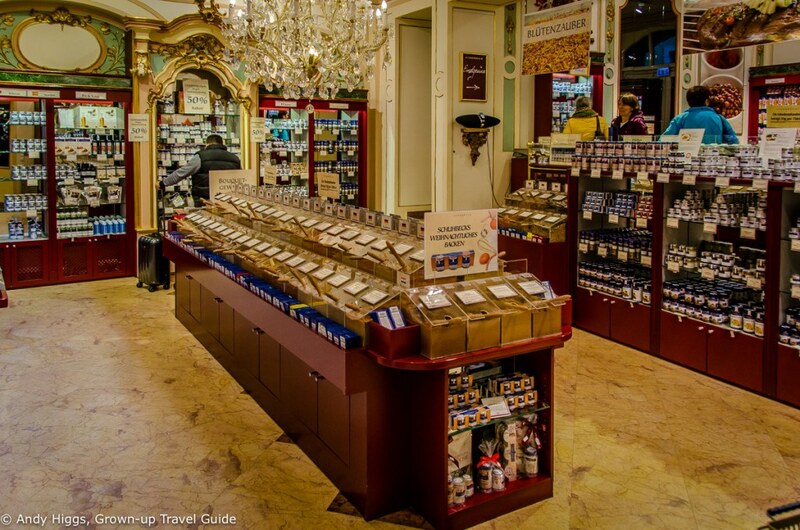 We then had a nose around a nearby spice shop belonging to a high profile Bavarian chef with a huge empire encompassing restaurants, books, branded equipment and ingredients. A German Jamie Oliver, in other words. The range of herbs and spices is quite astonishing and it’s guaranteed to give your sense of smell a workout. Happily it was now time for dinner. Most German cities have a restaurant in their town halls and Munich is no exception – however the Ratskeller here is exceptional in other ways. First of all it is enormous, but you should still book in advance. Secondly the food is wonderful and the atmosphere more akin to a beer hall than a restaurant. 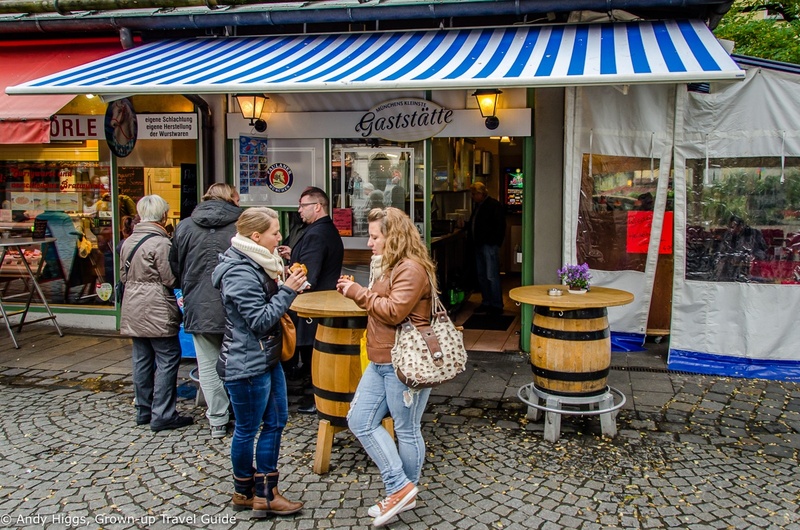 It seemed like ages since our last taste of wurst, but boy did we make up for it here. 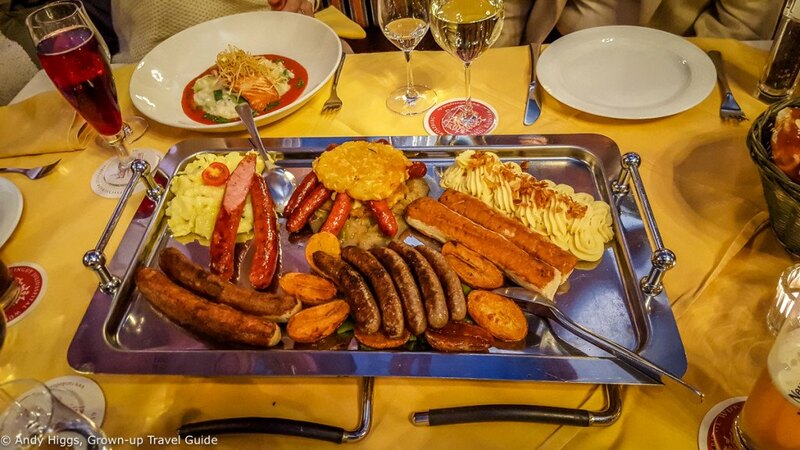 We ordered a sample of sausages to share and added five to our list. All were very tasty, even the odd-looking skinless ones. One variety we didn’t try here was the most famous one, weisswurst. This was because it was on our agenda for the morning at the place which apparently serves the best in Munich. 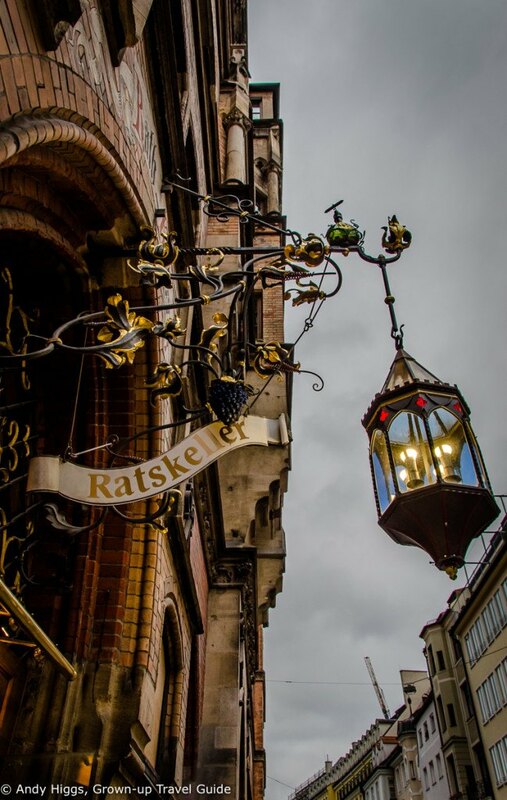 Even better from my point of view, the Ratskeller has an excellent range of weissbier, both on tap and bottled. We walked back to the hotel afterwards which perhaps burned off a wurst or two, but this was swiftly ruined by a beer in the hotel bar before calling it a night. The next day was Saturday and the end of the adventure. We woke early to enjoy an excellent breakfast at the Hotel Cristal and then met Reidun in the lobby afterwards. 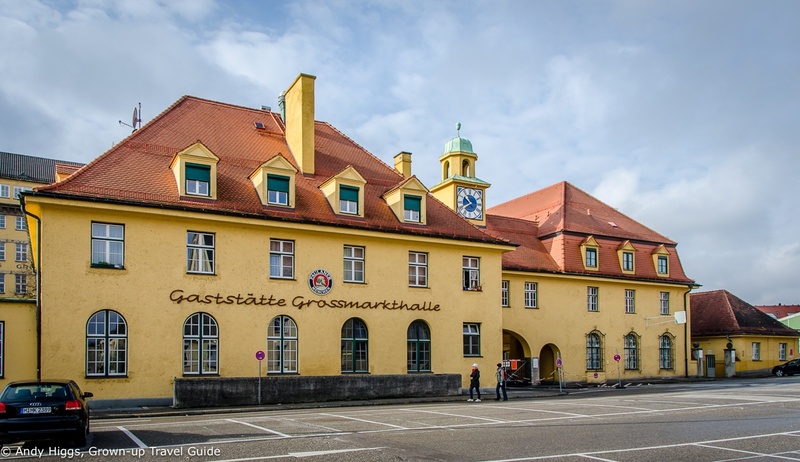 We had a short ride on the very efficient and easily navigable Munich U-Bahn system that brought us to the site of a huge wholesale fruit and vegetable market in the borough of Sendling, the aptly named “Grossmarkthalle”. If you want to see any action here you need to get up a lot earlier than we did, but suffice to say that a lot of trading takes place in the 300,000 m2+ area. Having said that we did get a look inside one of the halls, the only one still having the high pointed roof. 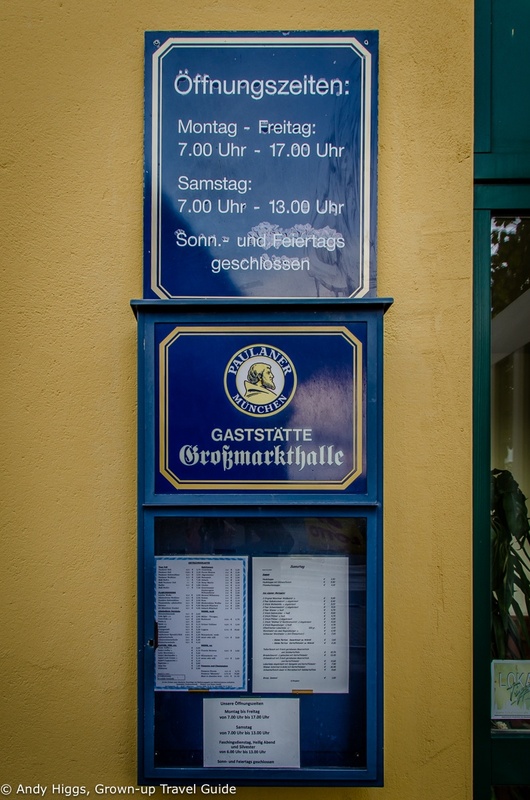 But this was the reason for our visit: Gaststatte Grossmarkthalle. 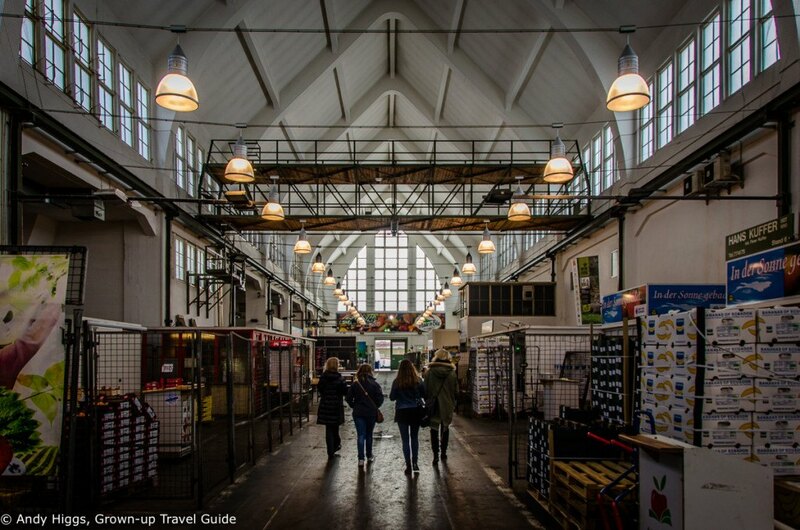 It’s a general rule of thumb that if you want great food at good prices visit an eatery near a market. 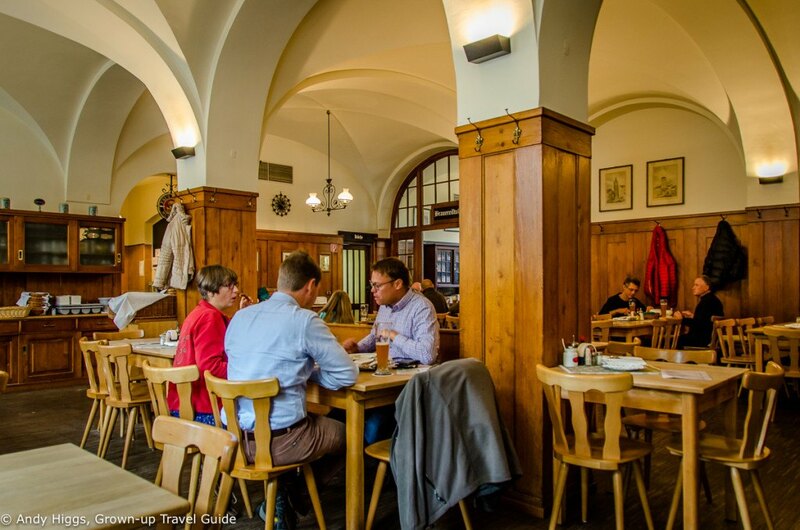 This is no exception; originally established to feed the workers next door it is now the place in Munich for weisswurst. 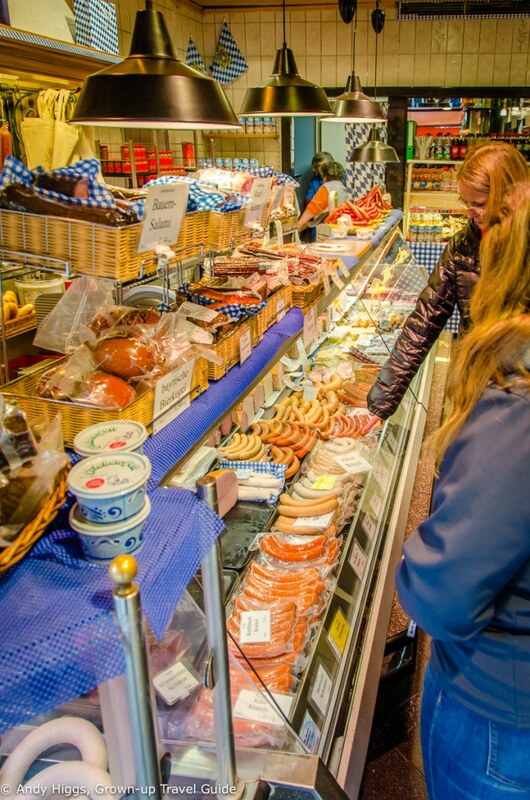 Weisswurst contains no preservatives so is prepared and eaten in the morning – typically as a “second breakfast”. 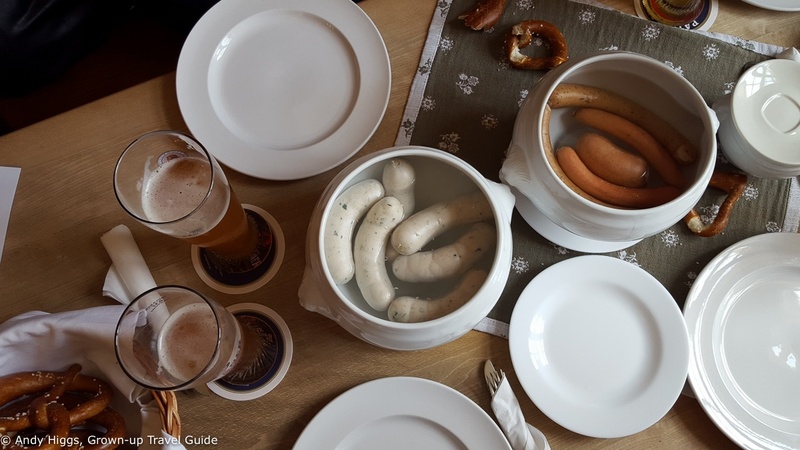 You can actually come here in the early afternoon too but traditionally weisswurst is supposed to be consumed before the midday church bells ring. Inside it’s very laid-back and the atmosphere is extremely friendly. Generally guests sit together on long tables and this leads to conversation and new acquaintances being made – keep your phone in your pocket! 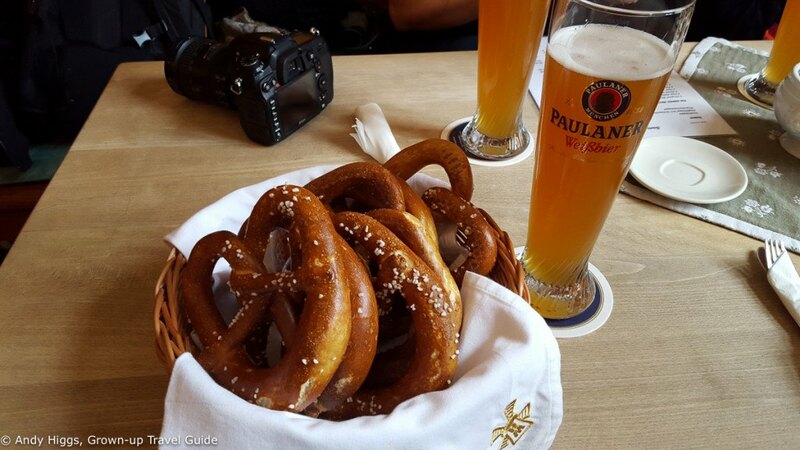 Pretzels are an important part of the meal – A basket is placed on each table for sharing but don’t put half-finished ones back in it; the system here is that you pay for the missing ones at the end. Weissbier is an essential accompaniment, which is of course wonderful at any time of the day. Before long the white beauties arrived, along with a few other varieties we had yet to try. Our goal was to break an overall total of 50 wurst for the entire project and we did this quite easily, which led us to go for 60. Weisswurst has a skin that is not generally eaten; if you are a pro like Reidun you eat the sausage by sliding the meat out after having bitten off the end. Alternatively you can cut it on your plate. Whichever method you choose, dip it in a special sweet mustard and you’re golden. 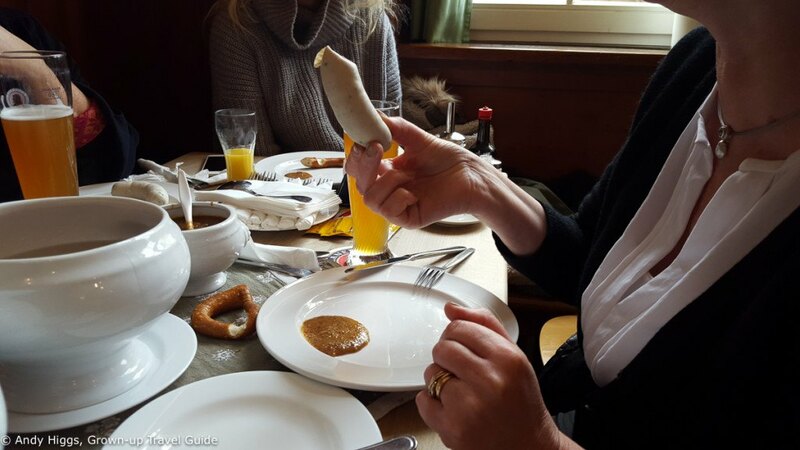 I was the only one in the group from Norway to have tried weisswurst before and already love them; the others were expecting something along the lines of a “medisterpølse” which looks the same and is eaten at Christmas in Norway. However the similarities end there as weisswurst are much tastier. We all liked them, and I really enjoyed this restaurant which you must put on the list when visiting Munich. 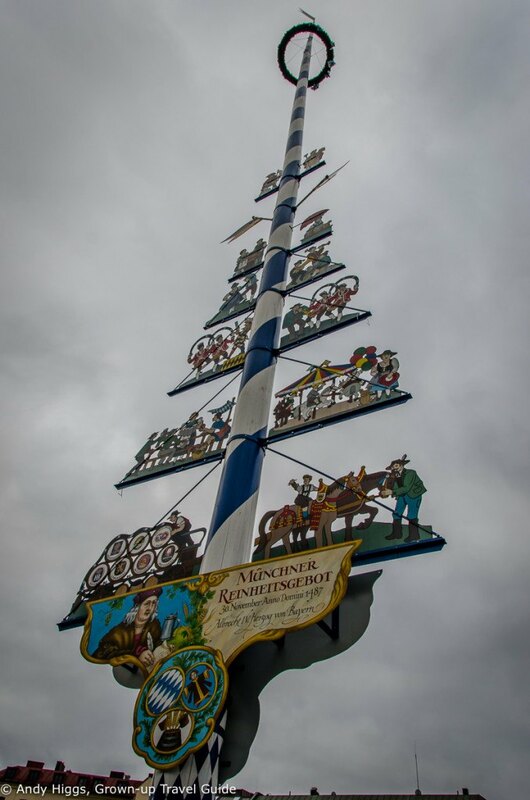 Before leaving Germany we had time for a visit to a local fair and market that only takes place three times a year and our timing was perfect. 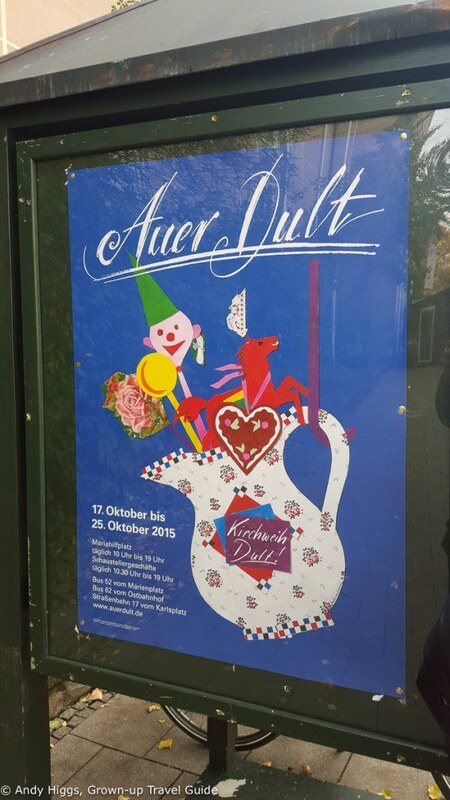 Auer Dult had in fact opened that very morning and we jumped on the tram to go and have a wander. 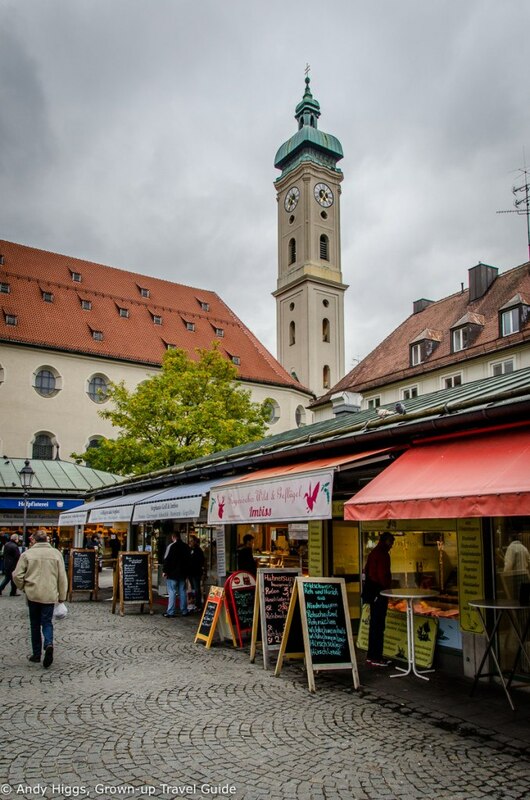 It’s a huge market surrounding the Mariahilf church in the Au district. 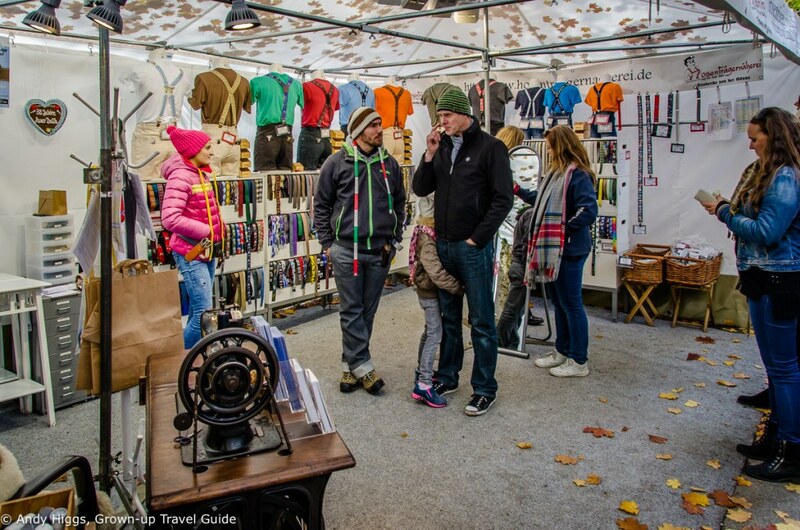 The majority of the stands sell household objects and new gadgets to make your life easier but there are of course clothing, food and souvenir stalls too. How can you ever go back to cleaning your windows the old way? Traditional costume is also on sale for all sizes. 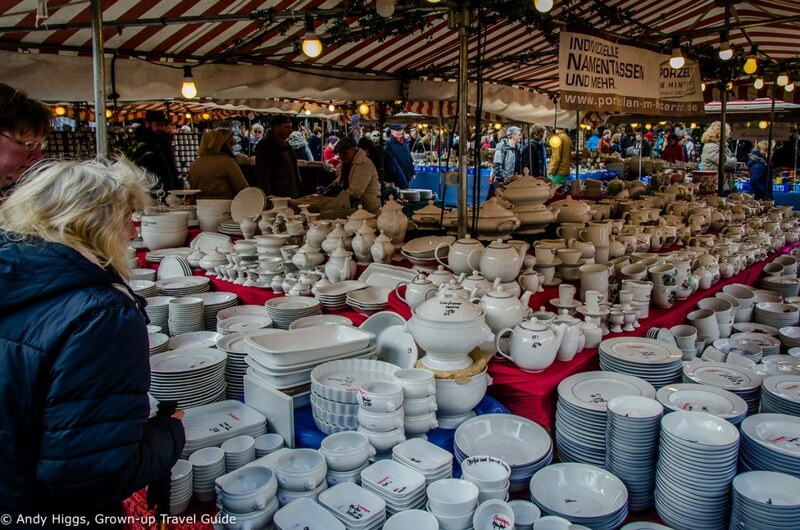 Auer Dult is also considered to be the largest crockery market in Europe, and chances are that if you have broken a piece from a set you’ll find a replacement here. I was quite tempted by the wurst pots but had no space in my bags. 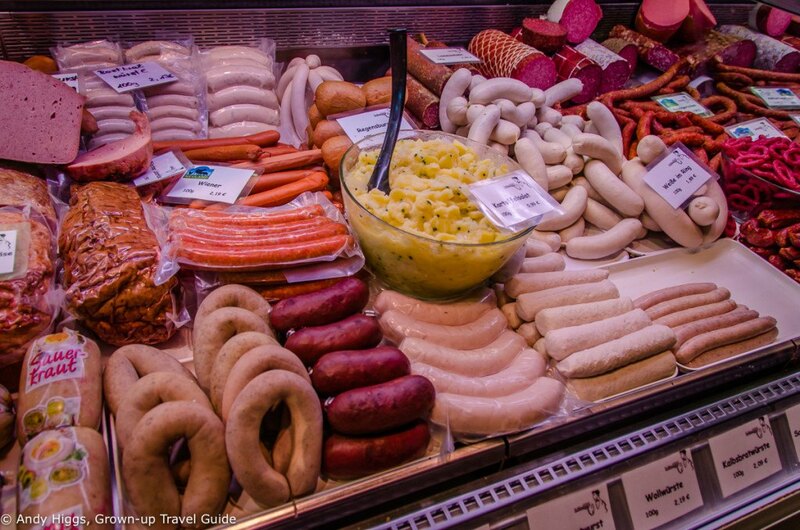 And of course there were wurst – lots of wurst. Yes, we hit the magic 60 for the entire 12 day period, with our group accounting for more than half. Yay! One stand provided us with several ‘new’ varieties for our list. These were very spicy and very nice too. With that, time was against us so we said our goodbyes to Reidun and made our way back to the hotel to collect our bags and return home. Germany, so long and thanks for all the wurst! With a very central location the Hotel Cristal is off to a good start. 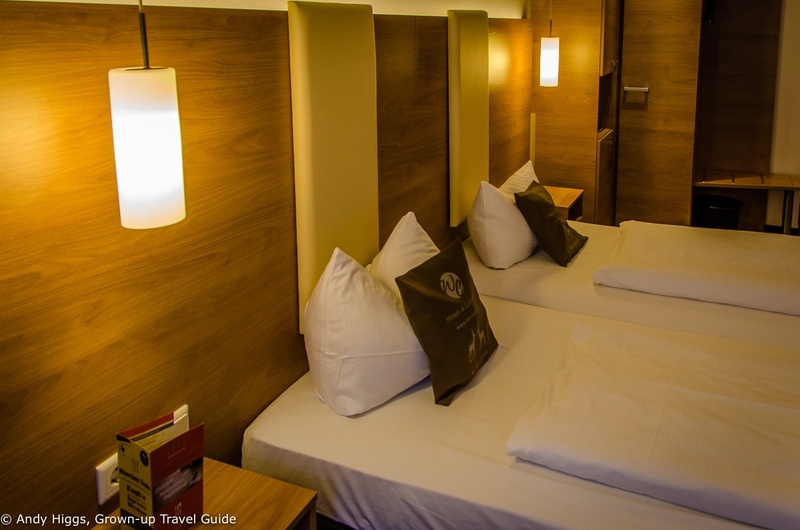 Despite the late check-in time I was immediately won over by the cleanliness and modernity. The street outside was quite lively but I never heard a thing. The carpets appeared almost new. 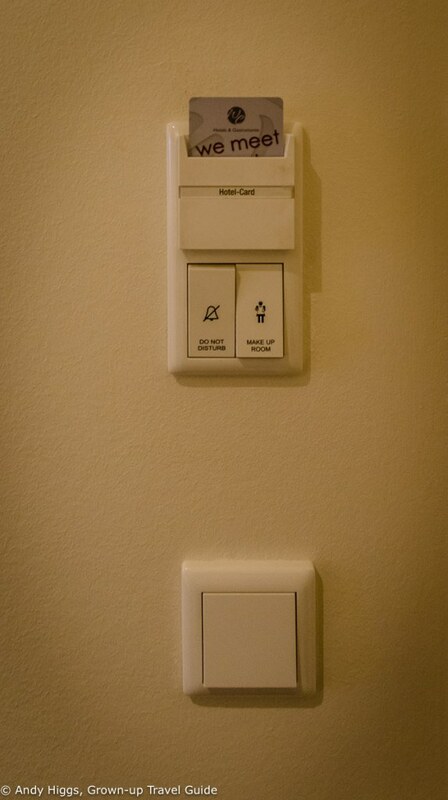 I liked the modern version of the “Do not disturb” sign. 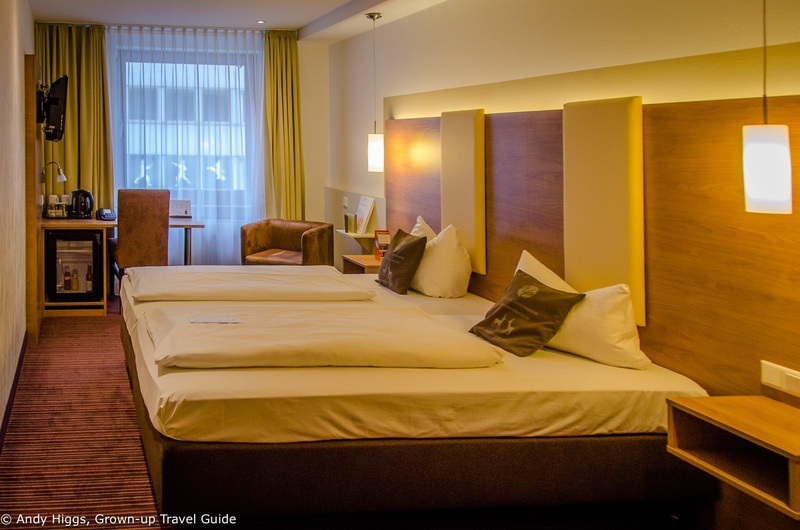 Yet again, a double bed in Germany means two singles together but both were very comfy. 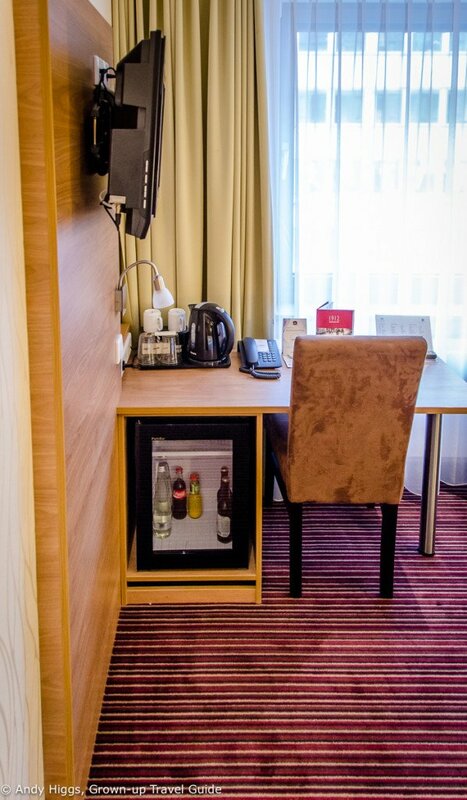 The desk was a good size for working and the mini bar was unusual – a fixed rate no matter how much or little you consume. Plus points for the multiple plug sockets – no need for an adapter here for most countries. Storage space was ample for a couple on a weekend trip. Nice touches with the customized pillows. 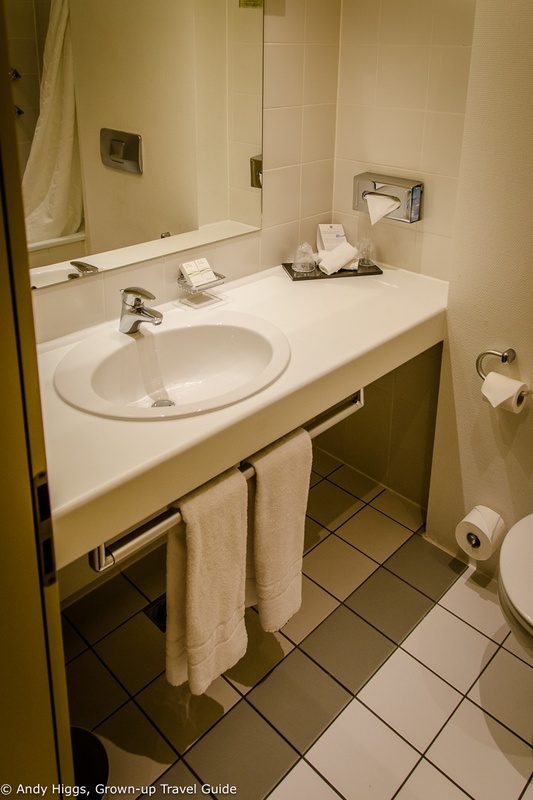 The bathroom was compact but featured a good sized bath – always a bonus. The shower had good water pressure too. Breakfast was excellent and featured a wide range of hot and cold food. 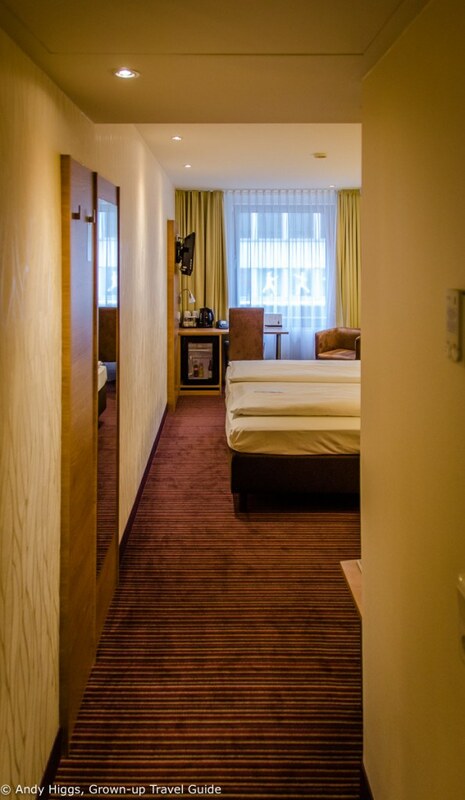 I would definitely recommend the Hotel Cristal for your next trip to Munich – and will use it myself when I get there next year. 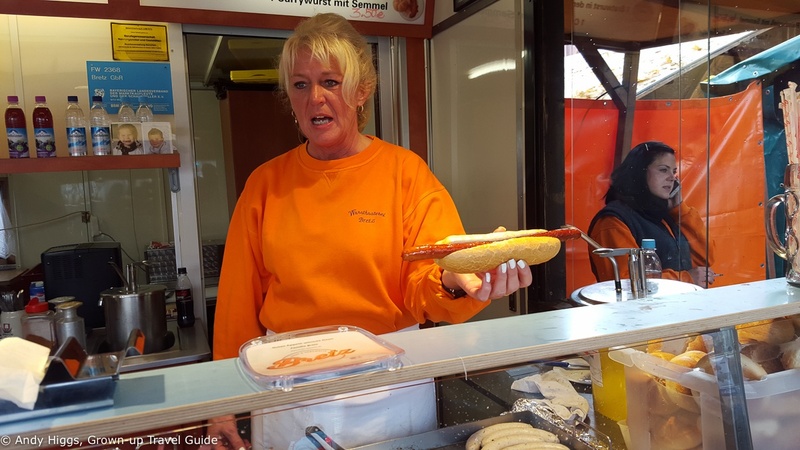 And my favourite of all the sausages I tried in Germany – Nurmburger bratwurst! 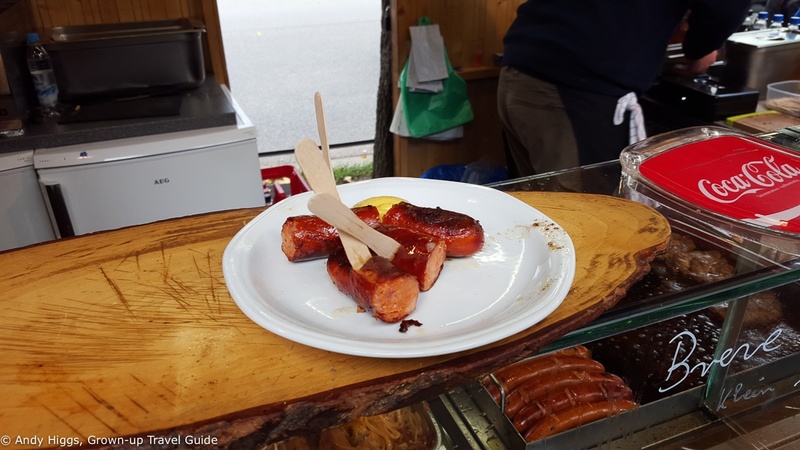 I hope you enjoyed the #WurstAdventure – look out for further themed trips in the future here on Grown-up Travel Guide!